As life gets less formal, neckties don't get worn like they used to, leaving us with a stash of unused ties. Recycle those lonely ties into 16 spectacular quilts and home accessories that look nothing like the typical stodgy necktie quilt! Showcase the rich colors, patterns, and textures found in ties with striking Hexagons, Log Cabins, Lone Stars, Flying Geese, and more. Learn how to wash ties, cut them, create appealing color combinations, and tame slippery fabric for quilting. Tie quilts make uniquely personal Father's Day, birthday, or any-occasion gifts for the tie-wearers in your life. 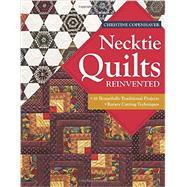 For both beginners and experienced quiltmakers. Christine Copenhaver has been sewing creatively since the seventh grade. Her quilts have been shown at The National Quilt Museum in Paducah, Kentucky; American Quilter's Society shows; art galleries; and quilt guild shows. Christine lives in Franklin, Tennessee.